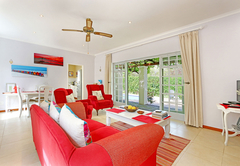 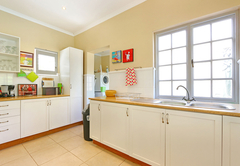 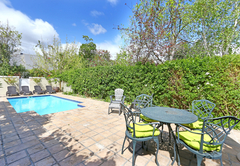 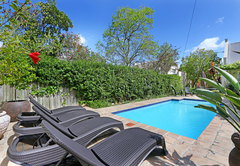 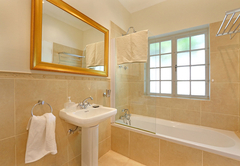 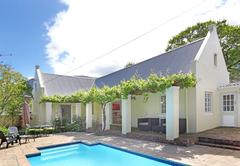 Heidi Cottage is a property providing self catering in Franschhoek for up to 4 guests visiting the Cape Winelands region. 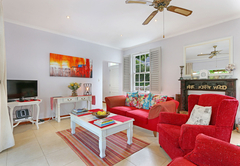 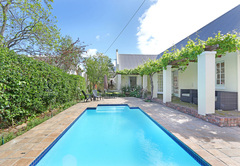 This charming upmarket Cape Dutch style cottage is located in a tranquil corner of beautiful Franschhoek village, a few minutes walk from the art galleries, restaurants and shops on the High Street. 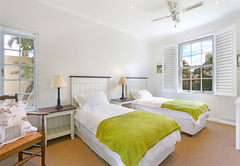 Heidi Cottage is ideal for families and children are welcome. 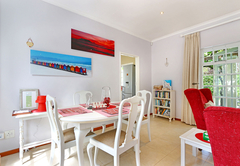 Immaculately decorated and furnished in a contemporary country style, Heidi Cottage has 2 bedrooms (choice of twin beds or a queen bed), 2 bathrooms, a separate cottage style kitchen and large separate lounge/dining room with feature fireplace and underfloor heating. 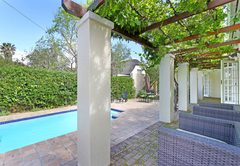 The patio doors lead onto a sunny verandah covered with grape vines, and an established very private garden filled with flowers and a delightful swimming pool. 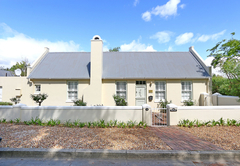 The front of the house is fringed with white rose and lavender bushes. 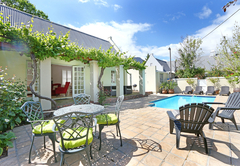 The private bougain villa filled side garden with mountain views is the perfect place to sit for a sundowner after a hard day by the pool or wine-tasting. 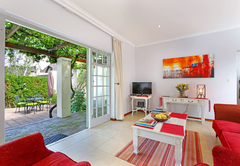 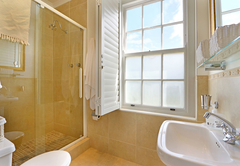 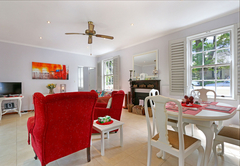 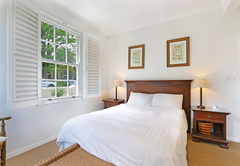 The property also offers a free wireless/wired ADSL internet access. 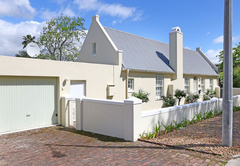 The house is alarmed and has off-street parking and a garage. 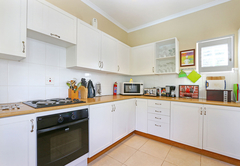 The house is fully equipped and includes a washing machine and tumble drier, dishwasher, microwave, ceiling fans and a satellite TV / DVD player.